Learn 6 ways to combine summer fun and learning. On a hot day, everybody loves lemonade — and lemonade stands! That old-time activity is actually a terrific opportunity for children to learn math and science skills (by measuring and mixing the lemonade) as well as social skills (when they interact with customers). Start by talking with your child about what she'll need: lemonade, a table and chairs, paper cups, decorations for the stand, a sign announcing the price, and a box to keep the money in. Where would be a good place to set up the stand? How much will she charge for each cup of lemonade? When it's time to make the lemonade, help her measure 4 tablespoons of lemon juice, 8 tablespoons of white grape juice, and 6 cups of water into a large plastic pitcher. Stir and chill. Outdoors, help her set up the stand and hang the sign. Demonstrate how to greet customers, pour, and serve the lemonade (if necessary, pour the lemonade into smaller pitchers to make it easier for your child to handle), and make change. When the big event is over, talk with her about what she'd like to do with the money she earned! Any kind of gardening is a great way for kids to learn the science of how things grow. Planting a theme garden can make the learning experience even more fun. One favorite is an ABC garden. Together with your child, look through seed catalogs or garden centers to choose what you'll plant — one variety for each letter of the alphabet. When you create your garden, have your child make a tag for each plant or paint the plant name on a rock with enamel paint. To make the project as rewarding as possible for your child, you'll want to steer him toward plants that are hardy and grow quickly in your area. Some of the most reliable vegetables and flowers are bush beans, cherry tomatoes, herbs, marigolds, radishes, zinnias, and zucchini. If you live in an urban area and don't have room for a full garden, try doing an abbreviated version of this activity. Choose vegetables or flowers that start with letters that spell out your child's name or initials, and plant them in a window box. How do doughnuts get their holes? Where does the mail in the mailbox go? How do farmers milk so many cows? You and your child can discover the answers by going behind the scenes at a doughnut shop, post office, or dairy. Just ask your local proprietors. They may be willing to allow chaperoned children to pay a visit and see all that goes on in their busy workplace. You may think of other great places to see as well! Before the trip, talk with your child about where you're going and what questions he'd like to ask when you get there. Write them down and bring them with you for reference. Take lots of photos of your trip, and help him put them in his summer scrapbook. Two important areas of the early childhood curriculum — literacy and dramatic play — come together when children act out their favorite stories. Give yourselves at least a week to put together a complete performance. First, invite your child to choose a story — anything from The Three Little Bears to Caps for Sale. Or encourage him to work with you to write his own story or play! After that, he can assign roles to siblings, cousins, or friends who want to get in on the act. Help the children rehearse their lines, design the sets, create the costumes, write up a playbill, and hand out tickets. Then raise the curtain and let the play begin! If kids have fun with this idea, next time you might suggest a concert or a magic show. To make the experiments an even richer learning experience, encourage your child to read books, draw pictures, or write a story about the topic you're investigating. Go out at night and capture lightning bugs in a clear plastic jar. Poke airholes in the top. Encourage your child to observe the insects carefully. Talk together about how they move and why and when they light up. After a day or two, release the insects outside. Make wind chimes with aluminum cans, plastic bottles, and string. Compare the sounds the different containers make. Place an ice tray in the sun and another in the shade. Compare how long it takes the ice in each tray to melt. Add different colors of food dye to crushed ice. Notice how the colors mix to create new ones. Why not add learning to your seaside adventures? Before you go, check your local library for books about fish, waves, boats, or other water-related topics. Read them together to prepare for your trip, and bring them along to read again in the car or under your beach umbrella. When you get there, the fun is just beginning! 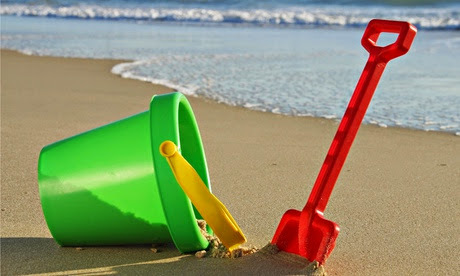 Slather on the sunscreen and encourage your child to search for treasures along the shore. Hunting for rocks, shells, or beach glass can take a whole afternoon. Talk about the wonderful diversity as you add to the collection. Back under the umbrella (or back at home), sort and classify the treasures by color, size, shape, or other category of your child's choice. Encourage her to add to the collection all summer long — and next summer too. To really learn, fail — then fail again!